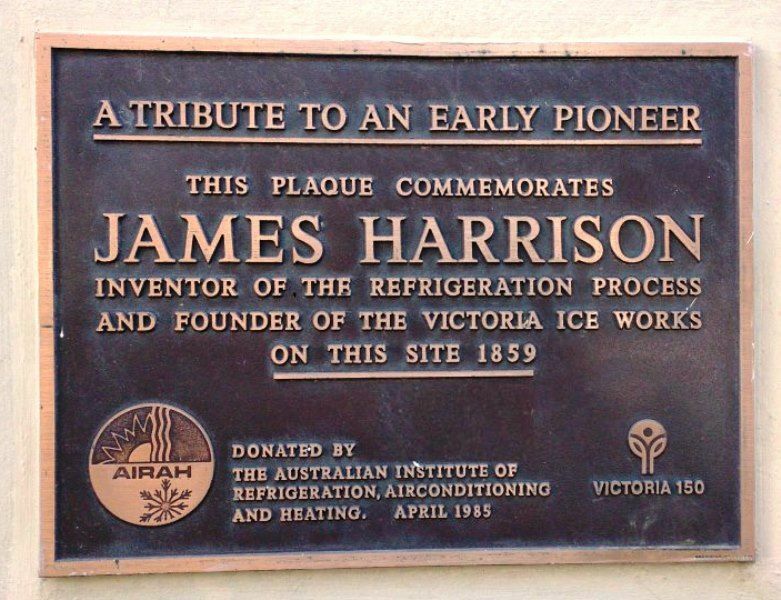 The plaque commemorates James Harrison, the inventor of the refrigeration process and founder of the Victorian Ice Works which was located on this site. The plaque was installed by the Victorian 150th Celebrations Committee. James Harrison (April 1816 - 3 September 1893) was an Australian newspaper printer, journalist, politician, and pioneer in the field of mechanical refrigeration. Harrison's greatest achievement and much of his financial failure stemmed from his inventions: he was a pioneer in all kinds of refrigeration. At Geelong he designed and built the plant for the first Australian manufacture of ice and began production at Rocky Point, taking out a local patent in 1854. A short trial at the new works convinced Harrison that Geelong could not use three tons of ice each day, so he moved to Melbourne where his daily output of ten tons also exceeded demand. Donated by the Australian Institute of Refrigeration, Airconditioning and Heating.